The temperature is rising and the sun is coming out – and you’re still hard at work. Dressing for warmer weather can be difficult enough without the restrictions of business attire, but don’t worry. We’re here to break down how to dress for the office even when temperatures are soaring, and help you stay cool, calm and collected all summer long. While it seems obvious, many people stick to darker suit colours and fabrics over the summer months, even when temperatures begin to rise. Ditch the heavier suits and embrace suits in lighter, more natural fabrics such as cotton or a linen cotton blend. Linen is also an acceptable option for the office, although this fabric can be prone to creasing, which can detract from the overall look of the suit. A linen cotton blend manages the worst of the creasing and retains the light nature of the suit – a blessing in hot weather. They’re great on the beach, but not suitable in a professional environment. 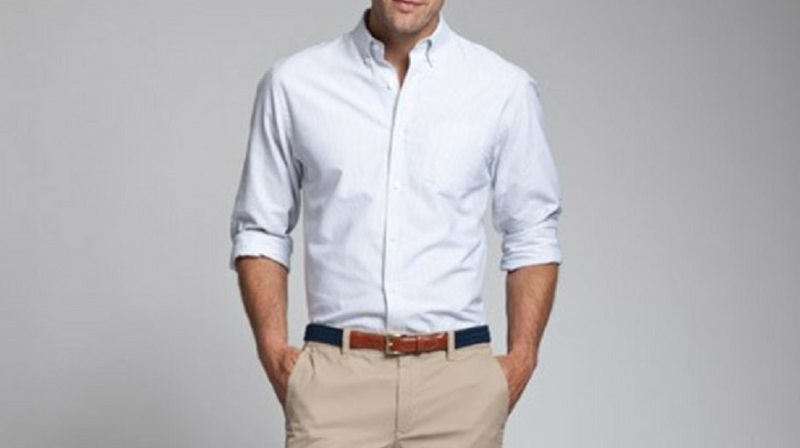 Trousers in lighter colours, such as lighter blues and tans are always suitable, and if your office is business casual, a pair of chinos with a blazer and tie can also be a great summer style combination. In terms of shoes, a slightly lighter formal shoe will work well with lighter suits, such as the Barker Haig or the Barker Butler. These offer a stylish and colourful alternative to a darker winter shoe, and work well with both business casual and professional business attire. You don’t need to spend a fortune on your summer wardrobe – instead focus on buying a few key pieces that you can mix and match. A few light shirts, blazers and trousers, with one lighter full suit, is enough to see you through the summer months. Stick to tan, light blues, navy and whites for a summer capsule wardrobe; you’ll find that these staples will last much longer than just this summer. A well-tailored waistcoat is an often-overlooked part of men’s business attire than can be a lifesaver in the warm summer season. Light greys and blues look great, and are versatile enough to be paired with a range of trousers and shirts. They keep you looking presentable, without the need for an uncomfortable suit jacket which can be unbearably warm. Ditch the dark belts, bags and shoes and embrace something a little lighter for your summer wardrobe. Belts like our Barker Plain Belt in Snuff Suede or Blue Suede are perfect for adding a touch of sophistication to your summer wardrobe. Whatever the look, Robinson’s Shoes is here for all your summer style needs. We’ve got a huge range of handcrafted leather shoes, belts and accessories, perfect for giving your wardrobe a style overhaul this summer. Your foot shape and your ideal last shape - what shoe for you?